Whenever it is hot and dry in the western United States, the frequency and intensity of wildfires there pick up. A good number of paleo records of climate and fire occurrence show that such has been true for many hundreds of years into the past. And just as it has been in the past, it likely will be in the future, with or without alleged human alterations in the climate. 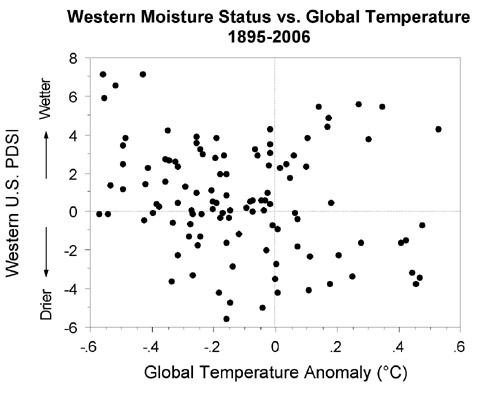 Figure 1 shows the observed relationship between global temperature anomalies and moisture conditions in the western United States, annually from 1895-2006. There is no statistically significant relationship between these two quantities, indicating that global temperatures have little influence on general moisture conditions in the western United States. So, just because “global warming” may lead to rising temperatures in the future, this does not assure an increase of wildfire producing drought conditions in the western United States. This relationship (or lack thereof) between global temperatures and western U.S. moisture conditions is important because moisture conditions are the primary driver of wildfire in the western United States. Figure 2 shows the co-occurrence of regional wildfire and dry conditions in the U.S. Northern Rockies for the past several hundred years. Notice that most regional wildfire (red triangles) occur when conditions are dry (PDSI is below zero, or summer precipitation is less than normal). This relationship, illustrated in Figure 2 for the northern U.S. Rockies, is typical of locations across the West. Most widespread wildfire outbreaks occur during times of low moisture levels, as would be expected. And periods of low moisture levels are not uncommon across the U.S. West. Figure 3 shows that dry conditions have been occurring for more than 1000 years there. Interestingly, the trend over the last millennium has been towards generally wetter conditions and a diminished area that has experienced drought conditions. In fact, one of the wettest periods during the past 1,000 years in the American west occurred during the early 20th century. Rather than anomalously wet periods, the most remarkable characteristic of the reconstructed drought history of the western United States shown in Figure 3 is the prolonged dry periods and “megadroughts” that occurred many time in past centuries—droughts that dwarfed the Dust Bowl and drought in the mid-1950s. Figure 3. Reconstructed drought history in the western United States for the past 12 centuries. (source: Cook et al., 2007). As noted elsewhere , the upshot of these observations linking drought with warming is that the Medieval Warm Period must have experienced much warmer temperatures than those yet experienced in the 20th century Modern Warm Period. This implication is also evident in still other of Cook et al.’s comparisons of the droughts of each period: (1) "Compared to the earlier ‘megadroughts’ … the current drought does not stand out as an extreme event, because it has not yet lasted nearly as long," (2) the MWP droughts "dwarf the comparatively short-duration current drought in the ‘West’," (3) "more intense droughts of longer duration have occurred in the past and could occur in the future," and (4) "the epoch of unprecedented aridity revealed in [the MWP] might truly be a harbinger of things to come in the West." From 33,039 annually resolved fire-scar dates at 238 sites (the largest paleofire record yet assembled), we examined forest fires at regional and subcontinental scales. Since 1550 CE, drought and forest fires covaried across the West, but in a manner contingent on SST modes. During certain phases of ENSO and PDO, fire was synchronous within broad subregions and sometimes asynchronous among those regions. In contrast, fires were most commonly synchronous across the West during warm phases of the AMO. ENSO and PDO were the main drivers of high-frequency variation in fire (interannual to decadal), whereas the AMO conditionally changed the strength and spatial influence of ENSO and PDO on wildfire occurrence at multidecadal scales. A current warming trend in AMO suggests that we may expect an increase in widespread, synchronous fires across the western U.S. in coming decades. The current state of the AMO, which is trending positive (www.cdc.noaa.gov/Pressure/Timeseries/AMO), may presage increased fire synchrony in the western U.S. in the near future. Probabilities of future climatic regime shifts have been calculated using probabilistic projections based on the tree-ring reconstruction of AMO. However, prediction of risk of future climate shifts based on probabilistic projections from past climate variability is seriously complicated if global warming is a major driver of temperature trends in the North Atlantic. Moreover, recent analysis of fire and hydroclimatic data from western U.S. forests indicates that warming temperatures and earlier springs may already be driving increased occurrence of large wildfires, and longer fire seasons in the past two decades. As others have noted these two influences (global or regional warming trends and positive AMO) may not add linearly, but either separately or combined these broad-scale climate trends do not bode well for ecosystems and human communities at risk from increasing wildfire hazards in the western U.S. But as we can see in Figure 1, a convincing case for anthropogenic climate impacts on western wildfires is a hard one to make. While it has been dry in the West for the past several years, it has been far drier in the past. So, one does not need to invoked global warming to explain why it is dry in the West, now, or in the future. All of these data-based revelations, which continue to accumulate, week after week, make one wonder how much longer the world’s climate alarmists can continue to claim, in contradiction of a mountain of evidence, that 20th-century global warming was unprecedented over the past two millennia. Although they clearly promote a falsehood in making this claim, they simply refuse to back down, for if the Medieval Warm Period was significantly warmer than it is today, when there was approximately 100 ppm less CO2 in the air than there is now, there is absolutely no reason in the world to attribute the warming of the past century to the concomitant increase in the air’s CO2 content; and, hence, there is absolutely no reason in the world to reduce anthropogenic CO2 emissions, which are a boon to the biosphere. In truth, it is likely a repeat performance of whatever was responsible for establishing and maintaining the warmth of the Medieval Warm Period that is responsible for bringing us the warmth of the Modern Warm Period, which has a long way yet to go before it can begin to compare with the magnitude of that earlier period of significantly elevated temperature. Direct observations show that throughout history wildfire and drought have been linked together in the western United States, with both influenced by natural oscillations in patterns of sea surface temperature and atmospheric circulation systems in the Atlantic and Pacific oceans. Past episodes of extensive dryness have been associated with wildfire frequency greater than anything that we have experienced in the past 100 years, prior to any probable widespread human impact on the composition of the atmosphere. 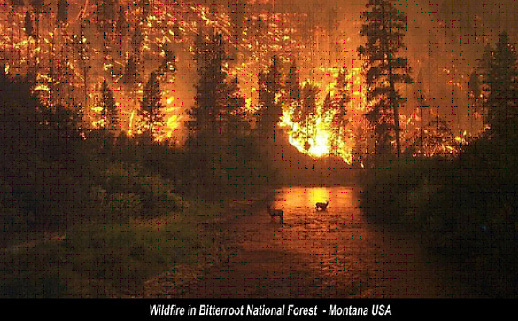 This demonstrates that without any human alterations, the climate can change and vary in such a manner as to make both drought and wildfire a much more common occurrence in the West than it is today. And if anyone expects us to believe that the recent increase in large-event forest fires is chiefly a consequence of 20th-century global warming, they need to acknowledge the fact that overwhelmingly the observational data clearly indicate it was much warmer during the Medieval Warm Period than it was over the past century, making the 20th century literally pale in comparison. Looking ahead, some computer models project that human activities might increase the frequency of droughts (and thus wildfire) in the American West (Seager et al., 2007). Other model projections aren’t so sure (Seager et al., 2007). But, a review of actual moisture observations collected and compiled for more than a century provides an indication that recent conditions in the West have not shown a long-term trend towards conditions more conducive to wildfires there—even though the atmospheric levels of carbon dioxide have been growing during that time. The ongoing drought in many parts of the West, which began in 1998, has led to a short term increase in the wildfire outbreaks, but, as can readily been seen from reconstructions of the past, such drought periods are hardly atypical. Nor do they definitively herald in a new era of megadrought and wildfire as a result of human’s use of fossil fuels. As it now stands, natural climate variations still play a large and probably dominant role in the frequency and occurrence of wildfires in the American West. Cook, E.R., et al., 2007. North American drought: Reconstructions, causes, and consequences. Earth-Science Reviews, 81, 93-134. Heyerdahl, E.K., et al., Multi-season climate synchronized widespread forest fires over four centuries (1630-2003), Northern Rocky Mountains USA. Seager, R., et al., 2007. Model projections of an imminent transition to a more arid climate in Southwestern North America, Science, 316, 1181-1184. Westerling, A.L., et al., 2006. Warming and Earlier Spring Increases Western U.S. Forest Wildfire Activity. Science, 306, 1015-1018. Woodhouse, C.A., et al., 2005. The 20th century pluvial in the western United States. Geophysical Research Letters, 32, L07701, doi:10.1029/2005GL022413. Riano, D., Moreno Ruiz, J.A., Isidoro, D. and Ustin, S.L. 2007. Global spatial patterns and temporal trends of burned area between 1981 and 2000 using NOAA-NASA Pathfinder. Global Change Biology 13: 40-50. Climate alarmists vehemently contend that rising global temperatures lead to more severe and longer-lasting droughts on the basis of simulations of global climate change produced by mathematical models that are primarily driven by increases in the atmosphere’s CO2 concentration. In this summary, we evaluate that strident claim for the western United States. This we do via a discussion of the findings of various scientific papers we have reviewed on our website that scrutinize the contention through the discerning microscope of real-world proxy climate data. We begin our journey of inquiry just below Canada, in the U.S. Pacific Northwest, from whence we gradually wend our way to the U.S./Mexico border. Knapp et al. (2002) created a 500-year history of severe single-year Pacific Northwest droughts from a study of eighteen western juniper tree-ring chronologies that they used to identify what they call extreme Climatic Pointer Years or CPYs, which are indicative of severe single-year droughts. As they describe it, this procedure revealed that "widespread and extreme CPYs were concentrated in the 16th and early part of the 17th centuries," while "both the 18th and 19th centuries were largely characterized by a paucity of drought events that were severe and widespread." Thereafter, however, they say that "CPYs became more numerous during the 20th century," although the number of 20th century extreme CPYs (26) was still substantially less than the mean of the number of 16th and 17th century extreme CPYs (38), when the planet was considerably colder. Hence, the data of this study fail to support the climate-alarmist claim that global warming increases the frequency of severe droughts. Gedalof et al. (2004) used a network of 32 drought-sensitive tree-ring chronologies to reconstruct mean water-year flow on the Columbia River at The Dales in Oregon since 1750. This study of the second largest drainage basin in the United States is stated by them to have been done "for the purpose of assessing the representativeness of recent observations, especially with respect to low frequency changes and extreme events." When finished, it revealed, in their words, that "persistent low flows during the 1840s were probably the most severe of the past 250 years," and that "the drought of the 1930s is probably the second most severe." More recent droughts, in the words of the researchers, "have led to conflicts among uses (e.g., hydroelectric production versus protecting salmon runs), increased costs to end users (notably municipal power users), and in some cases the total loss of access to water (in particular junior water rights holders in the agricultural sector)." Nevertheless, they say that "these recent droughts were not exceptional in the context of the last 250 years and were of shorter duration than many past events." In fact, they say that "the period from 1950 to 1987 is anomalous in the context of this record for having no notable multiyear drought events," once again demonstrating the fact that Pacific Northwest droughts have not become more severe or long-lasting as temperatures have risen over the course of the 20th century. Working in the Bighorn Basin of north-central Wyoming and south-central Montana, Gray et al. (2004) used cores and cross sections from 79 Douglas fir and limber pine trees at four different sites to develop a proxy for annual precipitation spanning the period AD 1260-1998. This reconstruction, in their words, "exhibits considerable nonstationarity, and the instrumental era (post-1900) in particular fails to capture the full range of precipitation variability experienced in the past ~750 years." More specifically, they say that "both single-year and decadal-scale dry events were more severe before 1900," and that "dry spells in the late thirteenth and sixteenth centuries surpass both [the] magnitude and duration of any droughts in the Bighorn Basin after 1900." In fact, they say that "single- and multi-year droughts regularly [our italics] surpassed the severity and magnitude of the ‘worst-case scenarios’ presented by the 1930s and 1950s droughts." Hence, if 20th-century global warming had any effect at all on Bighorn Basin precipitation, it was to make it less extreme rather than more extreme, in striking contradiction of the fervent claims to the contrary of the world’s climate alarmists. Moving further south, Benson et al. (2002) developed continuous high-resolution δ18O records from cored sediments of Pyramid Lake, Nevada, which they used to help construct a 7600-year history of droughts throughout the surrounding region. Oscillations in the hydrologic balance that were evident in this record occurred, on average, about every 150 years, but with significant variability. Over the most recent 2740 years, for example, intervals between droughts ranged from 80 to 230 years; while drought durations ranged from 20 to 100 years, with some of the larger ones forcing mass migrations of indigenous peoples from lands that could no longer support them. In contrast, historical droughts typically have lasted less than a decade. 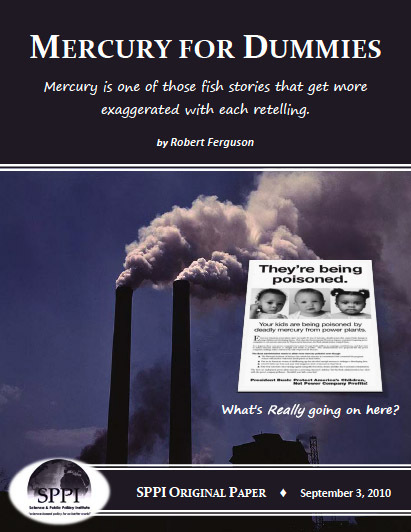 In another study based on sediment cores extracted from Pyramid Lake, Nevada, Mensing et al. (2004) analyzed pollen and algal microfossils deposited there over the prior 7630 years that allowed them to infer the hydrologic history of the area over that time period. Their results indicated that "sometime after 3430 but before 2750 cal yr B.P., climate became cool and wet," but, paradoxically, that "the past 2500 yr have been marked by recurring persistent droughts." The longest of these droughts, according to them, "occurred between 2500 and 2000 cal yr B.P.," while others occurred "between 1500 and 1250, 800 and 725, and 600 and 450 cal yr B.P," with none recorded in more recent warmer times. The researchers also note that "the timing and magnitude of droughts identified in the pollen record compares favorably with previously published δ18O data from Pyramid Lake" and with "the ages of submerged rooted stumps in the Eastern Sierra Nevada and woodrat midden data from central Nevada." Last of all, noting that Bond et al. (2001) "found that over the past 12,000 yr, decreases in [North Atlantic] drift ice abundance corresponded to increased solar output," they report that when they "compared the pollen record of droughts from Pyramid Lake with the stacked petrologic record of North Atlantic drift ice … nearly every occurrence of a shift from ice maxima (reduced solar output) to ice minima (increased solar output) corresponded with a period of prolonged drought in the Pyramid Lake record." As a result, Mensing et al. concluded that "changes in solar irradiance may be a possible mechanism influencing century-scale drought in the western Great Basin [of the United States]." Indeed, it would appear from their analysis that variable solar activity may well be the major factor in determining the hydrologic condition of the region. Only a state away, Gray et al. (2004) used samples from 107 piñon pines at four different sites to develop a proxy record of annual precipitation spanning the AD 1226- 2001 interval for the Uinta Basin watershed of northeastern Utah. This effort revealed, in their words, that "single-year dry events before the instrumental period tended to be more severe than those after 1900," and that decadal-scale dry events were longer and more severe prior to 1900 as well. In particular, they found that "dry events in the late 13th, 16th, and 18th Centuries surpass the magnitude and duration of droughts seen in the Uinta Basin after 1900," once again contradicting climate-alarmist "wisdom." At the other end of the moisture spectrum, Gray et al. report that the 20th century was host to two of the strongest wet intervals (1938-1952 and 1965-1987), although these two periods were only the seventh and second most intense wet regimes, respectively, of the entire record. Hence, it would appear that in conjunction with 20th-century global warming, precipitation extremes (both high and low) within northeastern Utah’s Uinta Basin have become more attenuated as opposed to more amplified, in yet another refutation of the climate-alarmist contention that both droughts and floods will become more severe and last longer in a significantly warmer world. Working in the central and southern Rocky Mountains, Gray et al. (2003) examined fifteen tree ring-width chronologies that had been used in previous reconstructions of drought for evidence of low-frequency variations in five regional composite precipitation histories. In doing so, they found that "strong multidecadal phasing of moisture variation was present in all regions during the late 16th-century megadrought," and that "oscillatory modes in the 30-70 year domain persisted until the mid-19th century in two regions, and wet-dry cycles were apparently synchronous at some sites until the 1950s drought." They thus speculate that "severe drought conditions across consecutive seasons and years in the central and southern Rockies may ensue from coupling of the cold phase Pacific Decadal Oscillation with the warm phase Atlantic Multidecadal Oscillation," which is something they envision as having happened in both the severe 1950s drought and the late 16th-century megadrought. Hence, there is reason to believe that episodes of extreme dryness in this part of the country may be driven in part by naturally-recurring climate "regime shifts" in the Pacific and Atlantic Oceans. Hidalgo et al. (2000) used a new form of principal components analysis to reconstruct a history of streamflow in the Upper Colorado River Basin based on information obtained from tree-ring data, after which they compared their results to those of Stockton and Jacoby (1976). In doing so, they found the two approaches to yield similar results, except that Hidalgo et al.’s approach responded with more intensity to periods of below-average streamflow or regional drought. Hence, it was easier for them to determine there has been "a near-centennial return period of extreme drought events in this region," going all the way back to the early 1500s. Consequently, it is reasonable to assume that if such an extreme drought were to commence today – which it well could – it would not be long before climate alarmists would be claiming it was caused by CO2-induced global warming, when in reality it could well be totally unrelated to either the air’s CO2 content or its temperature. Woodhouse et al. (2006) also generated updated proxy reconstructions of water-year streamflow for the Upper Colorado River Basin, based on four key gauges (Green River at Green River, Utah; Colorado near Cisco, Utah; San Juan near Bluff, Utah; and Colorado at Lees Ferry, Arizona) and using an expanded tree-ring network and longer calibration records than in previous efforts. The results of this program indicated that the major drought of 2000-2004, "as measured by 5-year running means of water-year total flow at Lees Ferry … is not without precedence in the tree ring record," and that "average reconstructed annual flow for the period 1844-1848 was lower." They also report that "two additional periods, in the early 1500s and early 1600s, have a 25% or greater chance of being as dry as 1999-2004," and that six other periods "have a 10% or greater chance of being drier." In addition, their work revealed that "longer duration droughts have occurred in the past," and that "the Lees Ferry reconstruction contains one sequence each of six, eight, and eleven consecutive years with flows below the 1906-1995 average." "Overall," in the words of the three researchers, "these analyses demonstrate that severe, sustained droughts are a defining feature of Upper Colorado River hydroclimate." In fact, they conclude from their work that "droughts more severe than any 20th to 21st century event occurred in the past," meaning the preceding few centuries; and, of course, this finding is just the opposite of what climate alarmists would have one believe, i.e., that global warming promotes longer lasting droughts of greater severity. In stark contrast to this model-based claim, the real-world record of Upper Colorado River Basin droughts suggests that such devastating climatic conditions are more strongly associated with the much colder temperatures that characterized the Little Ice Age. Moving closer still to the U.S. border with Mexico – in fact, right up to it – Ni et al. (2002) developed a 1000-year history of cool-season (November-April) precipitation for each climate division of Arizona and New Mexico from a network of 19 tree-ring chronologies. In reward for their efforts, they determined that "sustained dry periods comparable to the 1950s drought" occurred in "the late 1000s, the mid 1100s, 1570-97, 1664-70, the 1740s, the 1770s, and the late 1800s." They also note that although the 1950s drought was large in both scale and severity, "it only lasted from approximately 1950 to 1956," whereas the 16th-century mega-drought lasted more than four times longer. With respect to the opposite of drought, Ni et al. report that "several wet periods comparable to the wet conditions seen in the early 1900s and after 1976" occurred in "1108-20, 1195-1204, 1330-45, the 1610s, and the early 1800s," and they add that "the most persistent and extreme wet interval occurred in the 1330s." Consequently, for the particular part of the world covered by Ni et al.’s study, there appears to be nothing unusual about the extremes of both wetness and dryness experienced during the 20th century, which observation is again at odds with the contention of the world’s climate alarmists that global warming should produce extremes of both types, especially since they describe the 20th century as having experienced an unprecedented warming that NASA’s James Hansen claims has brought the world to within less than one degree of the all-time record high temperature of the last million or more years. Also working in New Mexico, Rasmussen et al. (2006) derived a record of regional relative moisture from variations in the annual band thickness and mineralogy of two columnar stalagmites collected from Carlsbad Cavern and Hidden Cave in the Guadalupe Mountains near the New Mexico/Texas border. From this work they discovered that both records "suggest periods of dramatic precipitation variability over the last 3000 years, exhibiting large shifts unlike anything seen in the modern record [our italics]." These findings again demonstrate that climate alarmists clearly go overboard when they characterize significant droughts and floods of recent times as being unprecedented over the past millennium or more, as well as when they attribute them to CO2-induced global warming. Moisture extremes much greater than those of the modern era are neither unusual nor manmade; they are simply a normal part of earth’s natural climatic variability. We come now to two papers that deal with the western United States as a whole. In the first, Cook et al. (2004) developed a 1200-year history of drought for the western half of the country and adjacent parts of Canada and Mexico (hereafter the "West"), based on annually-resolved tree-ring records of summer-season Palmer Drought Severity Index that were derived for 103 points on a 2.5° x 2.5° grid, 68 of which grid points (66% of them) possessed data that extended back to AD 800. This reconstruction, in the words of Cook et al., revealed "some remarkable earlier increases in aridity that dwarf [our italics] the comparatively short-duration current drought in the ‘West’." 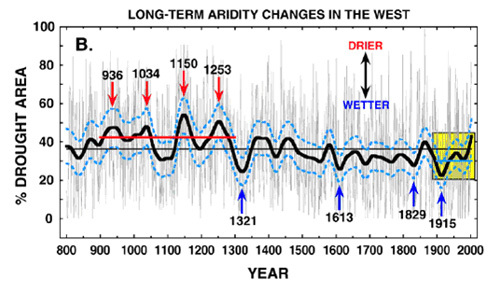 Interestingly, they report that "the four driest epochs, centered on AD 936, 1034, 1150 and 1253, all occur during a ~400 year interval of overall elevated aridity from AD 900 to 1300," which they say is "broadly consistent with the Medieval Warm Period." Commenting on their findings, the five scientists say "the overall coincidence between our megadrought epoch and the Medieval Warm Period suggests that anomalously warm climate conditions during that time may have contributed to the development of more frequent and persistent droughts in the ‘West’," as well as the megadrought that was discovered by Rein et al. (2004) to have occurred in Peru at about the same time (AD 800-1250); and after citing nine other studies that provide independent evidence of drought during this time period for various sub-regions of the West, they warn that "any trend toward warmer temperatures in the future could lead to a serious long-term increase in aridity over western North America," noting that "future droughts in the ‘West’ of similar duration to those seen prior to AD 1300 would be disastrous." We certainly agree with Cook et al.’s analysis, noting that such an unfortunate fate could well befall the western United States, even in the absence of (likely miniscule) CO2-induced global warming; for the millennial-scale oscillation of climate that brought the world the Medieval Warm Period (which was obviously not CO2-induced) could well be in process of repeating itself during the possibly still-ongoing development of the Modern Warm Period. In addition, as we discuss in more detail in our Editorial of 24 Nov 2004, if the association between global warmth and drought in the western United States is robust, it suggests that current world temperatures are still far below those experienced during large segments of the Medieval Warm Period. The last of the two papers to cover the western United States as a whole is that of Woodhouse (2004), who reports what is known about natural hydroclimatic variability throughout the region via descriptions of several major droughts that occurred there over the past three millennia, all but the last century of which had atmospheric CO2 concentrations that never varied by more than about 10 ppm from a mean value of 280 ppm. For comparative purposes, Woodhouse begins by noting that "the most extensive U.S. droughts in the 20th century were the 1930s Dust Bowl and the 1950s droughts." The first of these droughts lasted "most of the decade of the 1930s" and "occurred in several waves," while the latter "also occurred in several waves over the years 1951-1956." Far more severe than either of these two droughts was what has come to be known as the 16th-Century Megadrought, which lasted from 1580 to 1600 and included northwestern Mexico in addition to the southwestern United States and the western Great Plains. Then there was what is simply called The Great Drought, which spanned the last quarter of the 13th century and was actually the last in a series of three 13th-century droughts, the first of which may have been even more severe than the last. In addition, Woodhouse notes there was a period of remarkably sustained drought in the second half of the 12th century. It is evident from these observations, according to Woodhouse, that "the 20th century climate record contains only a subset of the range of natural climate variability in centuries-long and longer paleoclimatic records." It is also obvious that this subset, as it pertains to water shortage, does not even begin to approach the level of drought severity and duration experienced in prior centuries and millennia. This being the case, it is also clear it would take a drought much more extreme than the most extreme droughts of the 20th century to propel the western United States and adjacent portions of Canada and Mexico into a truly unprecedented state of dryness. We can also conclude from these observations that climate-alarmist claims that we are already feeling the climatic effects of anthropogenic CO2 emissions – as manifest in various types of extreme weather phenomena – are totally without merit, especially with respect to droughts in the western United States. And that is about all that needs to be said in characterizing the core findings of the papers listed under this particular topic in our Subject Index. Gray, S.T., Fastie, C.L., Jackson, S.T. and Betancourt, J.L. 2004. Tree-ring-based reconstruction of precipitation in the Bighorn Basin, Wyoming, since 1260 A.D. Journal of Climate 17: 3855-3865. Gray, S.T., Jackson, S.T. and Betancourt, J.L. 2004. Tree-ring based reconstructions of interannual to decadal scale precipitation variability for northeastern Utah since 1226 A.D. Journal of the American Water Resources Association 40: 947-960. Stockton, C.W. and Jacoby Jr., G.C. 1976. Long-term surface-water supply and streamflow trends in the Upper Colorado River Basin based on tree-ring analysis. Lake Powell Research Project Bulletin 18, Institute of Geophysics and Planetary Physics, University of California, Los Angeles.